Topiaries, whether formal or whimsical, large-scaled or edible, can be a fascinating addition to most garden spaces. A plant familiar to many gardeners because they have either grown it, eaten it, or admired it as a tiny topiary is the versatile herb, rosemary. Rosmarinus officinalis is an evergreen shrub hardy to zone 6. In its native Mediterranean environment, it can reach 6 feet, but in Chicago, gardeners are more accustomed to its dainty growth patterns. The pale blue flowers and pine-scented needles are as prized as its obliging willingness to be trained. An understanding of this fragrant herb’s preferred culture will help gardeners maintain healthy rosemary all year. Rosemary is happiest when grown in a soilless mix, which is a composition of vermiculite, perlite, and coarse peat. In the wild, it can tolerate a wide range of pH and moisture conditions, but it must have excellent drainage. This can be best accomplished when the plant is grown in a clay pot year-round. Clay permits faster evaporation of water, thus aiding in quick drainage. Year-round container growth also eliminates the need to transplant the rosemary into ordinary garden soil for the summer. During the active growing season, place the container in full sun, water only when the growing medium is dry, and fertilize with a dilute 20-20-20 solution every two weeks. Rosemary benefits from frequent snipping or pruning, whether grown as a topiary or simply as a small herb. To acclimate rosemary to indoor conditions in the fall, place the pot in partial shade for one week beginning September 1. Bring the pot indoors to a full sun location before you turn on indoor heat. 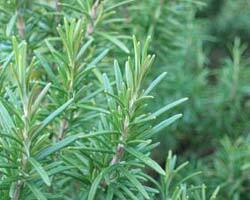 Most problems with rosemary develop over the winter months. Low light or high temperatures produce leggy, woody growth. Fungal problems arise when the plant is overwatered, overcrowded, or grown with little air circulation. Some gardeners change the growing medium to a cactus mix over the winter or spread an inch or two of pea gravel or sand over the top of the soil to encourage rapid evaporation. Organic mulches should be avoided since they retain moisture. Insects attracted to rosemary include whiteflies and mites. Careful monitoring and rotating insecticidal soap with a lightweight horticultural oil will help keep the foliage free of pests. In spring, repot only if the plant is losing vigor or is extremely potbound. Indoor plants often languish as they yearn for spring and outdoor conditions. But once mid-May arrives, rosemary can return to the outdoors where sun, warm breezes, and regular fertilizing will revitalize and encourage new growth.